This entry was posted in In The News and tagged COLUMN: Jack Binder, creator of roadside figures and signs in region, Jack Binder, Storytown U.S.A. sign. Bookmark the permalink. I had figured that the horse “ranch” down the road (the name escapes me), closer to Magic Forest if I’m not mistaken, was related to this statue (if not the same one just, ahem, reconfigured)–but I guess not? I know this is an old thread, but I do home movie film transfers, and just came across about 15-minutes of a family at Storytown and Ghost Town in September ,1957. In total, there’s about ten or fifteen minutes of pretty well shot 8mm home movies. I’m not very miffed about the horse and cowboy being gone – well not anymore anyway. 5 years ago I visited The Great Escape and got pretty upset. It “used to have” a sweet charm to it – a storybook land, a jungle land , a purple train that cruised along at a very nice pace exploring the nooks and. crannies of the park. Ghost Town had a locomotive that went through an animated mountain and an old west town completely built – not broken in half by a roller coaster that isn’t that good. That Storytown Train that took the place of the purple train is pale in comparison. It goes in a straight long forward and back to the station. Doesn’t explore too much. It is so heavy it can barely move. For the first 20 years of my life (1967 – 1987), my family traveled to Lake Grorge every year. 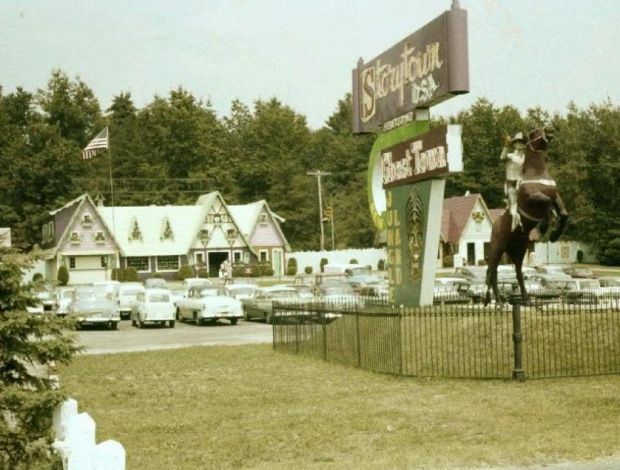 It always accompanied a day or two at Storytown USA. After its name change, it keeps themed section of the park called Storytown with its original charm intack. Jungeland was still there with its drum beats and moving animals. Even Ghost Town, which added a Semtesmin’ Demon looping coaster and the fun Desperation Okunge, still had the feel of an old west town. Anybody remember The Tornado? Rest In Peace Marshal Bill McKay. Six Flags took over, and The Great Escape now has a byline “A Six Flags Theme Park.” I understand the adding of more thrill rides. I enjoy roller coasters and flukes, spinning rides and the such. I’m fine with a Name Change. Storytown sounds like a kiddie park – not a family park. But take it over, call it a theme Park, and rip out all the themes? Barren houses with nothing to see doesn’t cut it as a Morher Goose storybook land. Alice and Wonderland can definitely use s paint job. I liked having Humpty Dumpty welcome guestס. He just sat on top of the wall, rocking back and forth, but it eas.a nice feel walking in, or pat International Village later on. and seeing.it. A lot of typos up there, and my phone, I see, changed words, so I apologize. Steamin’ Demon and Desperado Plunge flume ride for instance. I think it still makes sense. In a nutshell, an amusement park turned theme park should have never decided to remove its themed areas.